The quick and easy way to get your fire to a cooking-ready temperature. 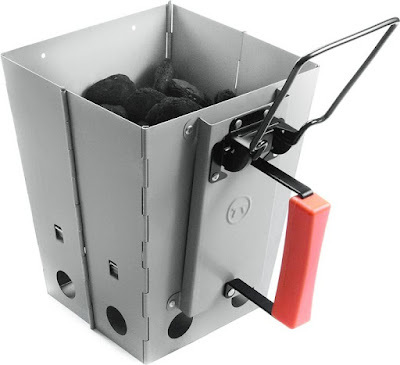 This chimney charcoal starter assembles (without tools) in less than 15 seconds and collapses even quicker, breaking down into 3 easy-to-store components. The durable, electrolyte plated carbon steel reservoir with its smart square design holds more charcoal than most chimney starters—about 110 briquettes (or 7 lbs), giving you all the heat you need, but the stay cool handle...well, it stays cool. extra large capacity: 110 briquettes or about 7 lb.